Much of the current burden of long-latency respiratory disease (LLRD) in Great Britain is attributed to historical asbestos exposure. However, continuing exposure to other agents, notably silica, also contributes to disease burden. The aim of this study was to investigate the incidence of work-related LLRD reported by chest physicians in Great Britain, including variations by age, gender, occupation and suspected agent. LLRD incidence and incidence rate ratios by occupation were estimated (1996–2014). Mesothelioma cases by occupation were compared with proportional mortality ratios. Cases were predominantly in men (95%) and 92% of all cases were attributed to asbestos. Annual average incidence rates (males) per 100 000 were: benign pleural disease, 7.1 (95% CI 6.0–8.2); mesothelioma, 5.4 (4.8–6.0); pneumoconiosis, 1.9 (1.7–2.2); lung cancer, 0.8 (0.6–1.0); chronic obstructive pulmonary disease (COPD), 0.3 (0.2–0.4). Occupations with a particularly high incidence of LLRD were miners and quarrymen (COPD), plumbers and gas fitters (asbestosis), and shipyard and dock workers (all other categories). There was a clear concordance between cases of SWORD mesothelioma and proportional mortality ratios by occupation. Occupationally caused LLRD continues to contribute to a significant disease burden. Many cases are attributable to past exposure to agents such as asbestos and silica, but the potential for occupational exposures persists. Long-latency respiratory diseases (LLRDs) are characterised by clinical presentation many years after first exposure to a causal agent. These diseases are typically potentially fatal or seriously debilitating, and include mesothelioma, lung cancer, chronic obstructive pulmonary disease (COPD) and pneumoconiosis (including asbestosis). They also include pleural plaques and diffuse pleural thickening (collectively known as non-malignant pleural disease (NMPD)). Pleural plaques, although not life-threatening, indicate past exposure and can be considered a marker of increased risk for the individual developing other, more serious, LLRDs. Diffuse pleural thickening, however, can cause disability . In 2014, there were 2515 deaths from mesothelioma in Great Britain (GB), of which 257 were recorded as having an underlying cause of asbestosis or other pneumoconiosis; and there were 4270 compensation awards for LLRD under the Industrial Injuries Disablement Benefit (IIDB) scheme [2, 3]. Globally, more than 33 000 deaths were attributed to asbestos in 2010, with asbestos-related respiratory diseases remaining one of the commonest causes of occupational morbidity and mortality . LLRD may be attributed to occupational or domestic/environmental exposures; the current occupational burden is largely attributed to asbestos exposure in previous decades. In regions with laws to prohibit the new use of asbestos, such as GB (where crocidolite and amosite were formally banned in 1985, and chrysotile in 1999), and regulations to control exposures arising from asbestos-containing materials in existing buildings , there is evidence that exposures have reduced substantially following the period of peak use (the 1960s for GB) . However, the presence of these materials means exposure still occurs, particularly for those employed in building maintenance and demolition work. Moreover, in other countries (for example Russia and China), asbestos is still actively used in processes such as the manufacture of roofing materials . There are also other agents associated with some types of LLRD that are still in active use or occur as contaminants – such as silica – for which there is ongoing potential for significant exposures to occur . It is therefore important to monitor the LLRD burden in GB (and elsewhere), including the types of occupations at risk and the agents to which workers are being exposed, so as to inform preventative measures. The aim of the present study was to investigate the incidence of occupational and work-related LLRDs in GB as reported by chest physicians to SWORD (Surveillance of Work-related and Occupational Respiratory Disease), including variations by age, gender, occupation and suspected causal agent. SWORD (established in 1989) is part of The Health and Occupation Research (THOR) surveillance network [8, 9]. Chest physicians report voluntarily for either one randomly selected month per year (“sample” reporters) or for all 12 months of the year (“core” reporters). Physicians report incident (newly diagnosed) cases seen during their reporting month(s) that they judge to have been caused or aggravated by work; data recorded are diagnosis, age, gender, first half of postcode (area and district), industry, occupation, causal agent(s) and date of symptom onset. Occupation and industry are subsequently coded using the Standard Occupational Classification  and Standard Industrial Classification , respectively. LLRD diagnoses of NMPD, mesothelioma, asbestosis, other pneumoconiosis, COPD, lung cancer and “other long latency” were extracted from SWORD (1996–2014 inclusive). Descriptive analyses were undertaken with results presented as “actual” counts (“sample” cases + “core” cases) and/or “estimated” counts ((12 × “sample” cases) + “core” cases). Annual average incidence rates (per 100 000 persons, per year) were calculated by diagnostic category and gender. Rates were summarised for all ages (20–89 years) and for 5-year age groups. Numerators (estimated case counts) were adjusted for the proportion of GB physicians participating in SWORD and the proportion responding during their reporting month(s) . The denominator was the total adult population (i.e. working + non-working) based on national population data (1996–2014) from the Office for National Statistics (ONS). Approximate 95% confidence intervals were calculated using a first order Taylor linearised variance estimator to take into account specific characteristics of the data (for example, weighted sampling adjustments to the numerator) . To assess LLRD incidence variation by occupation, incidence rate ratios (IRRs) were calculated for occupations with five or more actual cases, assuming a notional 30-year lag period between first exposure and disease onset. Occupations were re-coded to the 1970 Office of Population Census and Surveys classification of occupations . The denominator was based on 1971 census data. The reference category was the average of all other occupations combined. 95% confidence intervals were calculated, allowing for the increased uncertainty generated by sample reporting and the proportion of GB physicians participating in SWORD . Additionally, for men, we compared the proportionate distribution of SWORD mesothelioma cases and national mesothelioma deaths by occupation. Observed and expected numbers of mesothelioma deaths (2002–2010) by Standard Occupational Classification 2000 (SOC2000) code were available from the mesothelioma register, with expected deaths calculated using proportionate mortality methods . These expected deaths were rescaled so that they added up to the total number of estimated SWORD cases, in order to derive the number of expected SWORD cases by occupation. The ratio of observed to expected deaths for each occupation, i.e. the proportional mortality ratio (PMR), was then plotted against the ratio of estimated to expected SWORD cases to assess the similarity of the distribution of mesothelioma deaths and SWORD cases by occupation. LLRD diagnoses comprised 74% of the total (estimated) SWORD cases (the majority of the remaining 26% were of occupational asthma). NMPD diagnoses were reported most frequently (46% of the estimated LLRD) (table 1). Most frequently reported co-diagnoses were NMPD and lung cancer (15% of lung cancer cases and 2% of NMPD cases) but all other pairings of the main diagnostic groups were reported. The 28 LLRD physician-classified diagnoses in the “other” category are shown in table 2. Annual average incidence rates (per 100 000 persons) were higher for men than for women (table 1). For men, higher rates were observed for NMPD and mesothelioma compared to the other diagnostic groups. Cases were predominantly in men (95% of estimated cases) with a mean age of 69 years. Incidence rates in men for all conditions increased sharply with age, typically peaking at 75 years or above and then declining (figure 1). 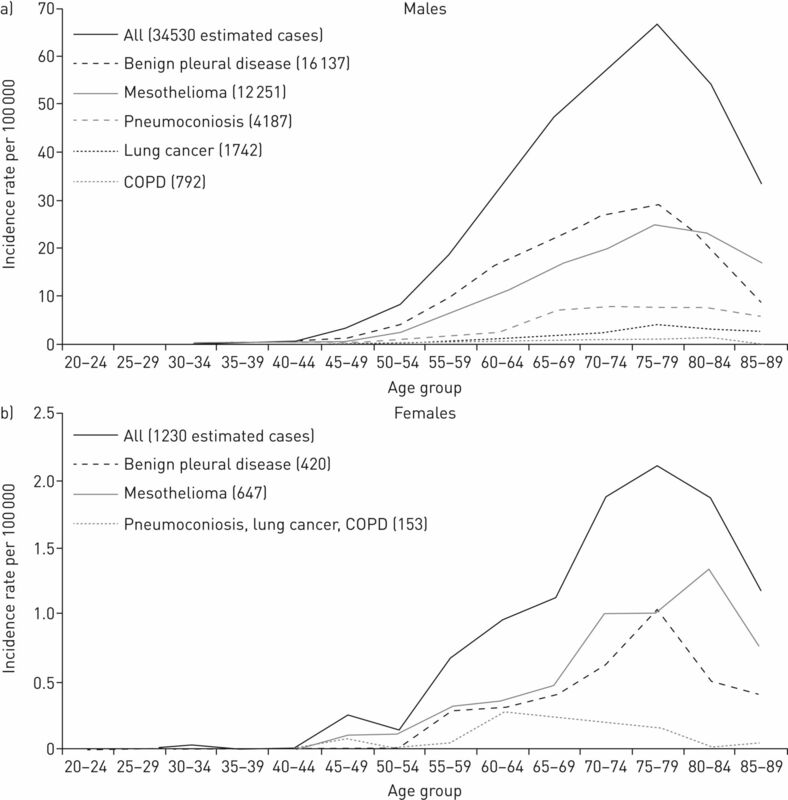 For pneumoconioses, incidence was broadly similar at 65–85 years. Incidence rates for women were lower than in men, at all ages, but peak incidence for NMPD also occurred at 75–79 years. Peak incidence of mesothelioma was slightly later, at 80–84 years. Incidence rates of long-latency respiratory disease reported by chest physicians to SWORD (Surveillance of Work-related and Occupational Respiratory Disease), by age and gender. a) Males and b) females. Asbestos was explicitly reported as the causal agent in 92% of actual cases (table 2); for NMPD and mesothelioma, this estimate was higher (99% and 94%, respectively), whereas for lung cancer, pneumoconiosis and COPD, the proportion of cases attributed to asbestos was lower (90%, 78% and 12%, respectively). For pneumoconiosis, 10% of cases were attributed to silica and silicates, and 8% to coal. Coal was the most frequently reported agent for COPD (41% of cases). Men with LLRD were most frequently in construction (39% of 35 344 estimated cases) and manufacturing (32%), and incidence varied considerably by occupation (figure 2 and table 3) with total LLRD incidence influenced strongly by the asbestos-related diseases, which comprised the majority of cases. For all LLRDs, incidence in the highest risk occupation (shipyard and dockworkers) was >10 times the average for all occupations. Similar IRRs were seen for the specific asbestos-related diseases, except asbestosis, where the ratio was somewhat lower. Larger variation in incidence was observed for COPD: the incidence among miners and quarrymen was 66 times the average for all occupations. Analyses of the incidence of pneumoconioses other than asbestosis also indicated substantial variation by occupation. For silicosis, IRRs were 30.2 (95% CI: 21.8–41.8) for miners and quarrymen, 10.9 (5.6–21.6) for glass and ceramics makers, and 10.7 (7.7–14.6) for construction workers. For pneumoconiosis attributed to coal, the IRR for miners and quarrymen was 935.2 (517.5–1690.1). Incidence rate ratios (IRRs) for long-latency respiratory disease (males) by occupation, as reported by chest physicians to SWORD (Surveillance of Work-related and Occupational Respiratory Disease), 1996–2014. LLRD cases in women were frequently reported in manufacturing (50% of 356 actual cases), and construction (7%). Occupations with the highest IRRs for all LLRDs combined, in women, were: construction workers, 11.1 (95% CI: 6.8–18.1); textile workers, 8.4 (6.5–10.8); glass and ceramics makers, 3.8 (1.7–8.3); electrical and electronics workers, 1.9 (1.0–3.4); other manufacturing workers, 1.7 (1.3–2.3). Female textile workers had a relatively high (compared to all other occupations) incidence of NMPD, mesothelioma and asbestosis, with IRRs of 10.8 (7.4–15.8), 6.8 (4.5–10.2), and 37.2 (14.8–93.2), respectively. Other manufacturing workers also had a relatively high incidence of asbestosis: IRR 7.4 (2.8–19.4). For lung cancer, COPD and other pneumoconiosis, no single occupation/occupational group had five or more actual cases. A clear correlation was observed: Spearman's rank correlation coefficient=0.58, significant at the 0.01 level (the grey line represents an exact correspondence) between (SWORD) cases in men and deaths from the mesothelioma register in terms of distribution by occupation (figure 3). Notable exceptions included pipe fitters (SOC2000: 5216) who comprised a much lower proportion of SWORD cases compared to the PMR. Conversely, occupations with low PMRs and relatively high proportions of SWORD cases included stevedores, dockers and slingers (9141); textile process operatives (8113); and roofers, roof tilers and slaters (5313). Proportion of mesothelioma cases reported to SWORD (Surveillance of Work-related and Occupational Respiratory Disease) (plotted on a log scale) by occupation versus proportional mortality ratios (PMRs), 2002–2010. n.e.c. : not elsewhere classified. This study provides an overview of chest physician-diagnosed LLRDs in GB over a 19-year period. NMPD and mesothelioma predominated (82% of cases), 95% of cases were in men, and asbestos was specified for 92% of the cases. Incidence typically increased until approximately 70–85 years and declined thereafter. The highest IRRs were observed for miners and quarrymen (COPD), plumbers and gas fitters (asbestosis), and shipyard and dock workers (all other categories). With a few notable exceptions, there was a clear correlation between the proportion of SWORD mesothelioma cases and PMRs by occupation. LLRD incidence rates were typically higher than in previous SWORD reports [17, 18]. For example, mesothelioma rates in men were approximately five per 100 000 per year in the present study, compared to three (SWORD data 1996–1999) and two (1989–1991). In the present (but not earlier) study, the numerator was adjusted for cases not captured due to non-participation and non-response . This approach might overestimate rates as it assumes that physicians not participating/responding would report, on average, at the same frequency as those that are. However, even with these adjustments, the true LLRD incidence in GB is probably underestimated. The SWORD “case capture” rate has likely declined since the estimate of 60% (2005–2007), because the number of GB chest physicians has increased, and SWORD reporter numbers have fallen slightly . However, since much of this increase in physician numbers has been in the sub-speciality of respiratory cancer, the SWORD “case-capture” rate is likely higher for diagnoses such as asthma compared to diagnoses such as lung cancer, mesothelioma and pleural plaques. Difficulties in attributing a case to work, particularly for diagnoses such as COPD and lung cancer, may also result in under-reporting to SWORD. Estimates based on the attributable fraction suggest a much higher GB incidence of occupational lung cancer (5442 cases in 2004 compared to an estimated 131 reported to SWORD) . Unsurprisingly, given the differences in occupational exposure, a higher incidence of LLRD was observed for men than for women. Incidence rates also generally increased with age, peaking at around 75 years and declining thereafter. A similar pattern is reflected in other data sources [20, 21]. The decrease in incidence in extreme old age is likely explained by the “healthy survivor effect”, where patients with LLRD die before reaching this point. Temporal trends in LLRD incidence are not included here but are investigated annually and have been published previously [22, 23]. Contrary to other data sources [24, 25], SWORD data generally suggest LLRD incidence to be stable or declining, the exception being pneumoconiosis, for which an increase in incidence was observed. However, changes in clinical practice over time are likely to have substantially influenced the observed trends; therefore, the findings need to be interpreted carefully. The high LLRD incidence for shipyard and dock workers (compared to all other occupations) was expected because, historically, this occupational group was amongst the most frequently exposed to asbestos . The comparatively low PMR (based on mesothelioma deaths) for this group may be underestimated. The mortality register records the last known occupation, and because (GB) shipbuilding had largely ceased by the 1980s, many exposed in this industry may have taken up other work after dockyard closure (e.g. in construction). However, another occupational group closely associated with shipbuilding – metal plate workers, shipwrights and riveters – had one of the highest PMRs. In general, movement from the occupation in which asbestos exposure took place (typically earlier in working life) into other jobs prior to retirement will tend to dilute the true differences between mesothelioma PMRs, but this will particularly affect those groups associated with industries that have declined or disappeared altogether. Another example of this effect may be textile process operatives. Conversely, SWORD – where reporters typically record the main occupation thought to be the source of exposure – could potentially overstate the true risk in certain cases, as exemplified by the relatively high proportion of SWORD-reported cases among motor mechanics and auto engineers in contrast with the particularly low PMR for this group. Discrepancies between PMRs and proportions by occupations in SWORD could also arise from unclear/limited information provided to either data source. Within SWORD, such ambiguities tend to result in the oversubscribing of cases to more “general” occupational groups. Some of the information reported to THOR may also be erroneous. For example, 241 mesothelioma/NMPD cases in SWORD were not attributed to asbestos. This is likely misattribution – a limitation of establishing causation in LLRD, as, by definition, the exposure had occurred decades ago. Similarly, because the criteria for reporting to THOR are fairly inclusive, some of the reported associations with other agents have arisen from co-exposures and misclassification of the true cause. Given the common exposure (asbestos) it is unsurprising that occupations with comparatively high IRRs (and their ranking) were similar for mesothelioma, NMPD, asbestosis and lung cancer. 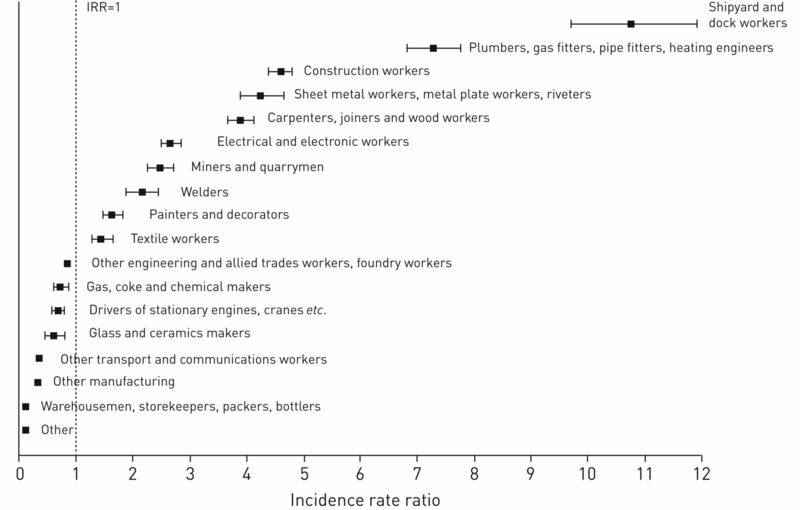 Of interest, plumbers and related occupations had the highest asbestosis IRR, with a further seven occupational groups also having comparatively high IRRs, suggesting high levels of exposure for these groups (the general consensus is that heavy asbestos exposures are required to produce clinically significant asbestosis within the lifetime of an individual) . Lung cancer was the only LLRD for which a statistically significantly higher IRR for the group “other engineering and allied trades, foundry workers” was observed. However, information about other risk factors, most notably tobacco smoking, may potentially affect the attribution of individual lung cancer cases. Pneumoconiosis attributed to coal and to silica was also investigated, with miners and quarrymen having a very high IRR for the former. This occupational group declined in number during the study period, so adjusting for this decline would likely increase the IRR further. Miners and quarrymen also had a relatively high IRR for silicosis, in addition to glass and ceramics makers and construction workers. An estimated 3.2 million EU (500 000 UK) workers are still routinely exposed to silica . This estimate is likely to increase with the potential for workers to be exposed to silica in new industries such as stone or artificial stone composite countertop fabrication and hydraulic fracturing [29, 30]. COPD rates were significantly higher for miners and quarrymen than those in other occupations. Approximately 94% of cases were attributed to coal dust, an established cause of COPD that is compensable under IIDB . This study, and others, also revealed an increased risk of COPD for welders . Because welding trades account for approximately 79 000 workers in the UK (according to the 2014 LFS), this could imply that a significant proportion of the population are at risk. Of the SWORD LLRD cases, 5% were in women. Occupations with relatively high IRRs tended to be in manufacturing, most notably textile workers (mainly asbestos manufacture). Interestingly, the suggested increased risk of LLRD for teachers  was not borne out by SWORD data, with only four cases in women reported (and two in men). The denominator for the rates in table 1 and figure 1 was the total (i.e. working + non-working) adult British population (1996–2014). This approach may underestimate incidence among those originally exposed. However, attempting to calculate incidence among the smaller, originally exposed, historic populations (using lagged working population as the denominator) risks overestimating the originally exposed subgroup of the working population by an unknown amount. It also introduces other uncertainties by ignoring survival and requiring an assumption about an appropriate lag period. When comparing relative incidence by occupation, however, lagged denominators were deemed necessary to allow for the possibility that the sizes of some occupational groups had changed substantially since the exposure period. Hence, the denominator was the number employed (by occupation) according to the 1971 census. However, the use of data from a single year (historical workforce data is limited and not necessarily comparable over time) may still have led to under- or overestimation of IRRs for occupations for which the exposed population changed significantly during the estimated exposure period. This approach also makes assumptions about the lag period between exposure and disease onset, i.e. restricting it to 26–44 years (depending on the year the case was reported) and, for any 1 year, the same for all diagnoses. This is a relatively crude approach, and a limitation of this study. There may be considerable variation in this lag assumption, both within and between diseases . In conclusion, this study provides a useful overview of the status of LLRD in GB over the past two decades and shows the continuing incidence of LLRD arising from historical exposure to agents such as asbestos, silica and coal. These findings are informative for other countries that have had similar exposure patterns. For example, the Netherlands had a historically early and high average asbestos use per capita, with shipbuilding a significant source of exposure, followed by the early introduction of control measures . Furthermore, the identification of occupations at increased risk from agents still encountered or in active use, such as welders exposed to welding fumes or construction workers exposed to silica, provides useful information for the targeting of preventative activities. The authors are grateful to all physicians who report to the THOR schemes. Support statement: This work was partly supported by the Health and Safety Executive in the UK (contract number PRJ500). The information and views set out in this article are those of the authors and do not necessarily reflect the official opinion of the Health and Safety Executive. Funding information for this article has been deposited with the Crossref Funder Registry. , et al. Clinical consequences of asbestos-related diffuse pleural thickening: A review. J Occup Med Toxicol 2008; 3: 20. The Health and Safety Executive. Table Meso01: Death certificates mentioning mesothelioma, 1968-2014. Table ASIS01: death certificates mentioning asbestosis, 1978-2014; Table DC01: Deaths due to occupationally related lung disease, other than mesothelioma and asbestosis in Great Britain, 1993-2014. www.hse.gov.uk/statistics/tables/index.htm#iidb Date last accessed: May 10, 2017. The Health and Safety Executive, Industrial Injuries Disablement Benefit Scheme. Table IIDB05: Prescribed industrial diseases of the lungs and new cases of assessed disablement by disease. www.hse.gov.uk/Statistics/tables/index.htm#iidb Date last accessed: May 10, 2017.
, et al. Occupational lung diseases: from old and novel exposures to effective preventive strategies. Lancet Respir Med 2017; 5: 445–455. Statutory Instruments 2012 No. 632. Health and Safety. The Control of Asbestos Regulations 2012. www.legislation.gov.uk/uksi/2012/632/pdfs/uksi_20120632_en.pdf Date last accessed: May 10, 2017. Date last updated: February 27, 2012.
, et al. The expected burden of mesothelioma mortality in Great Britain from 2002 to 2050. Br J Cancer 2005; 92: 587–593. , et al. Artificial stone silicosis: disease resurgence among artificial stone workers. Chest 2012; 142: 419–424.
. Occupational respiratory disease in the United Kingdom 1989: a report to the British Thoracic Society and the Society of Occupational Medicine by the SWORD project group. Br J Ind Med 1991; 48: 292–298. The University of Manchester, Centre for Occupational and Environmental Health (COEH). The Health and Occupation Research (THOR) network. www.coeh.man.ac.uk/thor Date last accessed: May 10, 2017. Office for National Statistics. Standard Occupational Classification 2000. London, The Stationery Office, 2000. Office for National Statistics. Standard Industrial Classification of Economic Activities 2007. Basingstoke, Palgrave Macmillan, 2009.
, et al. Improving estimates of specialist-diagnosed, work-related respiratory and skin disease. Occup Med 2011; 61: 33–39.
. Introduction to Variance Estimation. 2nd edn. New York, Springer, 2007. Office of Population Censuses and Surveys. Classification of occupations, 1970. London, HMSO, 1970.
, et al. Medically reported work-related ill-health in the UK agricultural sector. Occup Med 2010; 60: 340–347. Health and Safety Executive. Table MESOOCCUPATION3. Table 3: Mesothelioma PMRs by SOC2000 occupation for males aged 16-74 in Great Britain 2002–2010. http://www.hse.gov.uk/statistics/tables/index.htm#lung Date last accessed: May 10, 2017.
. Work-related respiratory disease in the United Kingdom, 1989-1992: report on the SWORD project. Occup Med 1994; 44: 183–189. , et al. SWORD'99: surveillance of work-related and occupational respiratory disease in the UK. Occup Med 2001; 51: 204–208. , et al. The burden of occupational cancer in Great Britain: overview report prepared for the Health and Safety Executive (HSE) 2010. www.hse.gov.uk/research/rrpdf/rr800.pdf Date last accessed: May 10, 2017. Cancer Research UK. Mesothelioma incidence statistics. www.cancerresearchuk.org/health-professional/cancer-statistics/statistics-by-cancer-type/mesothelioma/incidence#heading-One Date last accessed: May 10, 2017. Date last updated: December 1, 2016.
, et al. Incidence of the pneumoconioses in the United Kingdom general population between 1997 and 2008. Respiration 2012; 84: 200–206. , et al. Measurement of trends in incidence of work-related skin and respiratory diseases, UK 1996–2005. Occup Environ Med 2008; 65: 808–814. , et al. Time trends in the incidence of work-related ill-health in the UK, 1996–2016: estimation from THOR surveillance data: Report to the UK Health and Safety Executive. www.hse.gov.uk/statistics/pdf/thortrends17.pdf Date last accessed: May 10, 2017.
, et al. Continuing increase in mesothelioma mortality in Britain. Lancet 1995; 345: 535–539. , et al. 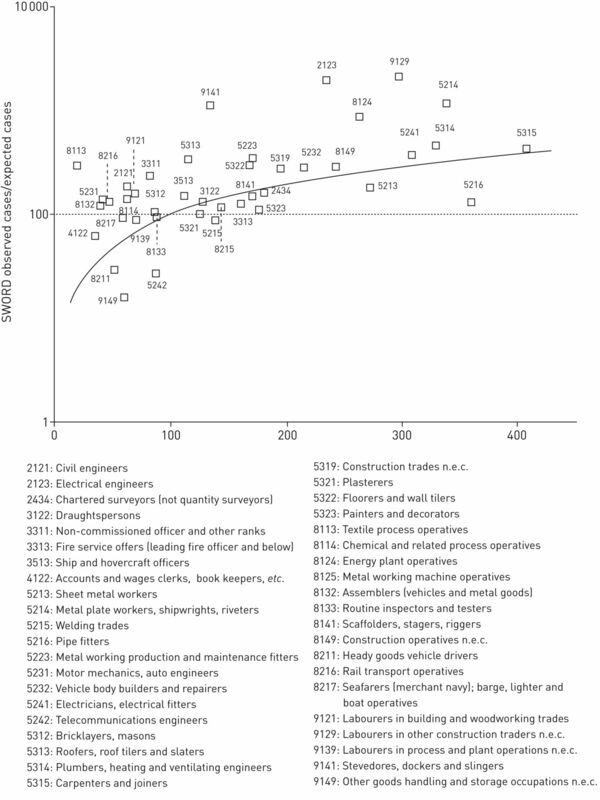 Trends in mortality from occupational hazards among men in England and Wales during 1979-2010. Occup Environ Med 2016; 73: 385–393.
. A review of historical exposures to asbestos among skilled craftsmen (1940-2006). J Toxicol Environ Health B Crit Rev 2007; 10: 319–377. , et al. Asbestos, asbestosis, and cancer, the Helsinki criteria for diagnosis and attribution 2014: recommendations. Scand J Work Environ Health 2015; 41: 5–15. , et al. Occupational exposure to carcinogens in the European Union. Occup Environ Med 2000; 57: 10–18.
. Determinants of respirable silica exposure in stone countertop fabrication: a preliminary study. J Occup Environ Hyg 2013; 10: 368–373. , et al. The health implications of fracking. Lancet 2014; 383: 757–758. Department for Work and Pensions. Industrial Injuries Disablement Benefits: technical guidance. Appendix 1: List of diseases covered by Industrial Injuries Disablement Benefit. www.gov.uk/government/publications/industrial-injuries-disablement-benefits-technical-guidance/industrial-injuries-disablement-benefits-technical-guidance Date last accessed: May 10, 2017. Date last updated March 30, 2017.
, et al. Incidence and prevalence of chronic bronchitis: impact of smoking and welding. The RHINE study. Int J Tuberc Lung Dis 2012; 16: 553–557. The asbestos schools group. Asbestos in schools: the scale of the problem and the implications. 30th October 2011. www.asbestosexposureschools.co.uk/asbestos%20exposure%20in%20schools.pdf Date last accessed: May 10, 2017.
. Latency of asbestos disease among insulation workers in the United States and Canada. Cancer 1980; 46: 2736–2740. , et al. Asbestos: use, bans and disease burden in Europe. Bull World Health Organ 2014; 92: 790–797.